The main difference between fascicular cambium and interfascicular cambium is that fascicular cambium or intrafascicular cambium is the vascular cambium present in between the xylem and phloem of a vascular bundle whereas interfascicular cambium is the vascular cambium present between two vascular bundles. Fascicular and interfascicular cambium are two types of vascular cambium tissues, which occur in the dicot stem during different growth stages. Furthermore, fascicular cambium serves as the primary meristem at the beginning and becomes secondary meristem later while interfascicular cambium is a secondary meristem, which fuses together with the fascicular cambium to form a continuous ring of meristematic tissue. Fascicular cambium is the primary meristematic tissue present between the xylem and phloem of a vascular bundle. As it is located between the xylem and phloem, fascicular cambium is also known as intrafascicular cambium. It develops from the procambium of the stem apex. The main function of the fascicular cambium is to produce primary xylem towards the center of the stem and to produce primary phloem towards the periphery. 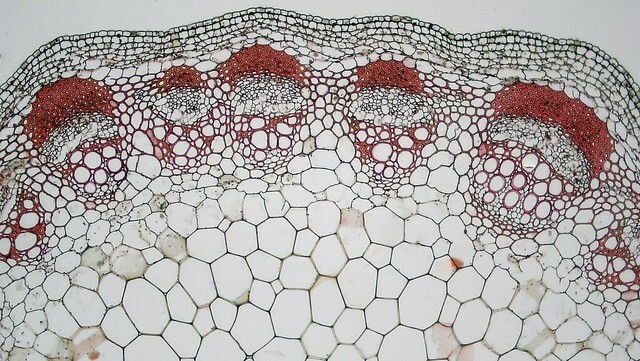 Furthermore, during the secondary growth of the stem, fascicular cambium is transformed into the secondary meristem, producing vascular tissue inside the region of vascular bundles. Interfascicular cambium is the secondary meristematic tissue present between two vascular bundles in the dicot stem. During the secondary growth of the stem, this cambium develops from the cells of the medullary rays. Both interfascicular and fascicular cambium fuse together to form a ring of vascular cambium in the secondary stem. 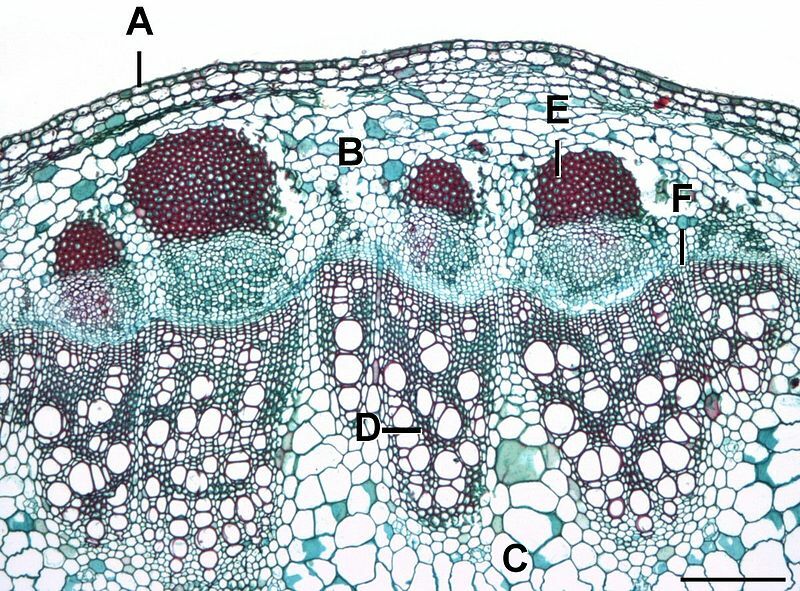 The main function of this vascular cambium ring is to develop secondary xylem towards the center of the stem and secondary phloem towards the periphery of the stem. Fascicular and interfascicular cambium are two types of vascular cambium tissues in the dicot stem. Both are made up of actively dividing meristematic cells. Besides, their main function is to produce vascular tissue. Also, they produce xylem towards the inner side of the stem while phloem towards the outer side. Fascicular cambium refers to the cambium that develops within the vascular bundles in the stem of a plant while interfascicular cambium refers to the cambium arising between the vascular bundles in the stem of a plant. Thus, this is the main difference between fascicular cambium and interfascicular cambium. Moreover, fascicular cambium can be both primary and secondary meristem while interfascicular cambium is a type of secondary meristem. 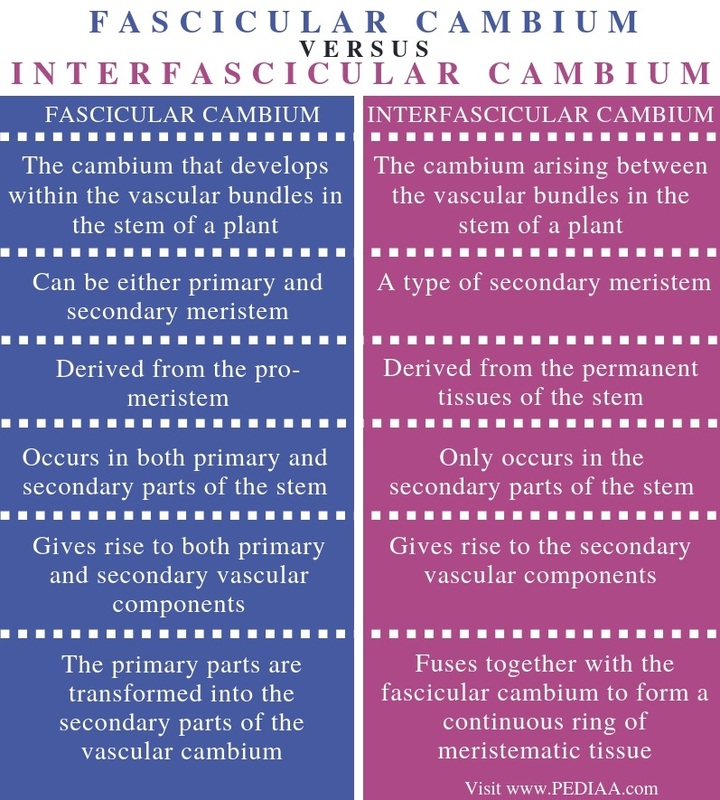 Another difference between fascicular cambium and interfascicular cambium is that fascicular cambium is derived from the pro-meristem while interfascicular cambium is derived from the permanent tissues of the stem. Also, while fascicular cambium occurs in both primary and secondary parts of the stem, interfascicular cambium only occurs in the secondary parts of the stem. Furthermore, fascicular cambium gives rise to both primary and secondary vascular components while interfascicular cambium gives rise to the secondary vascular components. Hence, this is the functional difference between fascicular cambium and interfascicular cambium. Besides, an important difference between fascicular cambium and interfascicular cambium is their significance in the plant growth. The primary parts of the fascicular cambium are transformed into the secondary parts of the fascicular cambium while the interfascicular cambium fuses together with the fascicular cambium to form a continuous ring of meristematic tissue. Fascicular cambium is a type of primary meristem that occurs between the xylem and phloem of a vascular bundle of the dicot stem. It is responsible for the formation of vascular tissues of the vascular bundle in the primary stem and then, it is transformed into the secondary meristem. In contrast, interfascicular cambium is a type of secondary meristem that occurs between two vascular bundles. Moreover, it arises from the permanent tissues of the stem and fuses with the fascicular cambium to form a continuous ring of vascular cambium. Therefore, the main difference between fascicular cambium and interfascicular cambium is the location in the stem and the type of growth. 1. “(Inter)Fascicular Cambium.” Virtual Classroom Biology, Radboud University Nijmegen, Available Here.